In these places will be banned production and sale of non-recommended for children and students of food. Foods not recommended for children and schoolchildren are products with an increased content of food additives harmful to health,,ru,fats,,ru,salt,,ru,sweeteners and others,,bg, жиров, соли, sugar, подсластителей и т.д. To the list of products,,ru,meters from the educational institutions included caramel,,ru,biz,,sr,cakes with cream and chocolate,,ru,glazed chocolate curds,,ru,chips,,ru,hamburgers,,ru,pizza,,ru,fat,,ru,mayonnaise,,ru,peanuts and all kinds of nuts,,ru, are forbidden to use in school and to sell within 100 метров от учебных заведений вошли карамель, chocolate, бизе, пирожные с кремом и шоколадом, глазированные шоколадные сырки, чипсы, гамбургеры, пицца, колбаса, сало, майонез, арахис и все виды орехов, fried potatoes,,ru,processed cheese,,ru,salty biscuits and bagels,,ru,salted sunflower seeds,,ru,syrki and peanuts,,ru,As well as other products with a salt content greater than,,ru,and fats,,ru,g product,,bg,pepper,,ru,thousand,,ru, плавленный сыр, margarine, соленые печенья и бублики, соленые семечки, сырки и арахис, а также другую продукцию с содержанием соли больше 1,5 гр., sugar – больше 15 gr. и жиров – больше 20 gr. in 100 г продукта. Also in the list included products with more energy value 300 kcal 100 гр., and containing food additives (gum, sports drinks, instant food products). Energy Drinks, coffee and spices (vinegar, mustard, horseradish, перец, ketchup, pepper) are prohibited. According to the Ministry of Health of Moldova, These restrictions will allow preschoolers and school children have the habit of healthy foods and allow children to avoid disease, related to metabolism and the endocrine system. Violators will be accepted penalties: Individuals, that do not comply with the provisions of the law, will be fined 200-400 lei, and legal entities – on 2-3 thousand lei. According to Ministry of Health, in Moldova 137,2 diabetes on 10 thousand people, and in children – 20,4 cases per 10 тысяч. In the last year 57 new cases of diabetes in children. 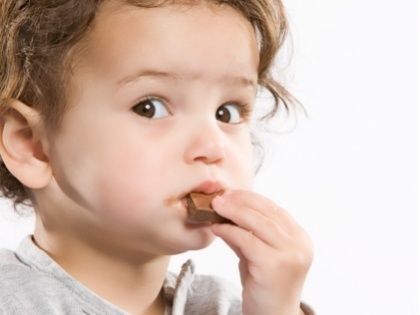 Nutritionists say – the later the child learns the taste of chocolate is better for his health.